RRR Farms, LLC. is a multi-level training facility where starting absolute novice riders and horses is just as common as training for a specific skill or polishing the "finished" horse. RRR Farms prides itself on catering to the amateur owner. We encourage client interaction with their training horses and specialize in teaching clients to become "do-it-yourselfers". RRR Farms is very competitive on a number of show circuits, with the primary focus being on the Arabian "A" circuit. 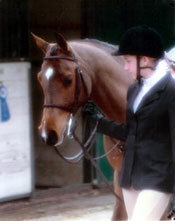 Also attended are a number of Hunter/Jumper and Open "schooling" shows. There are horse show opportunities for all budgets, ages and experience levels. RRR Farms provides customer oriented horse boarding, alongside top quality horse training and lesson programs. Specializing in starting young horses and young riders on the road to successful careers in the show ring.